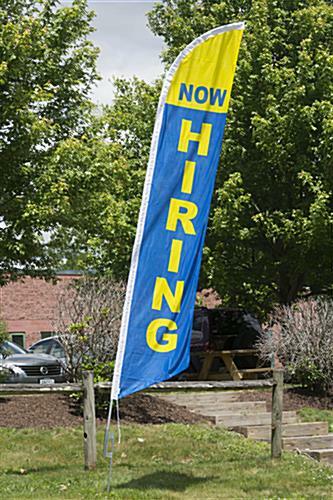 These hiring message flags are ideal for use outside businesses looking to add employees or inform passersby about job openings. 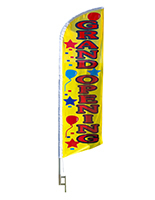 Each of these 14-foot tall high visibility advertising fixtures comes with a dye-sub banner with bold blue and yellow text and color blocks, a sturdy sectional aluminum support pole, and a ground spike for outdoor installation. 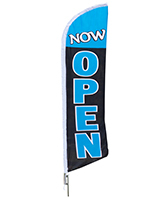 These message flags that say "Now Hiring" are easily seen by potential customers or applicants and can be installed in any soft ground, turf, snow or sand. 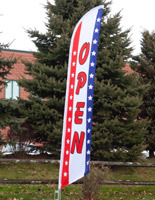 The simple design is easily assembled and the high through-print allows the messaging to be seen from either direction. 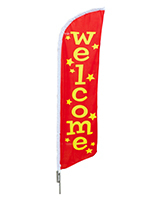 These 14' tall employment flags for outdoor use make a great addition to any business employment advertising program. 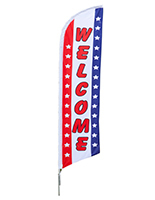 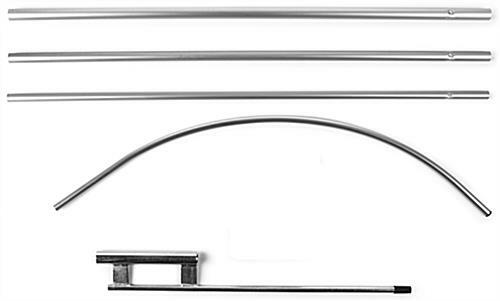 The sectional silver aluminum base features a curved top section that keeps each printed job advertising banner in place.